What a mess the world economy is in. $57 trillion has been added to central bank balance sheets since 2007. How can the world defeat a world recession by adding more debt? Also the deleveraging has not happened yet. We still don’t have the rampant inflation that many doomsayers though we would have had. Where will this all end? Nobody knows but more prosperity for everyone seems unlikely. As you can see from the chart, the 200 day moving average is a good bit below the current price. 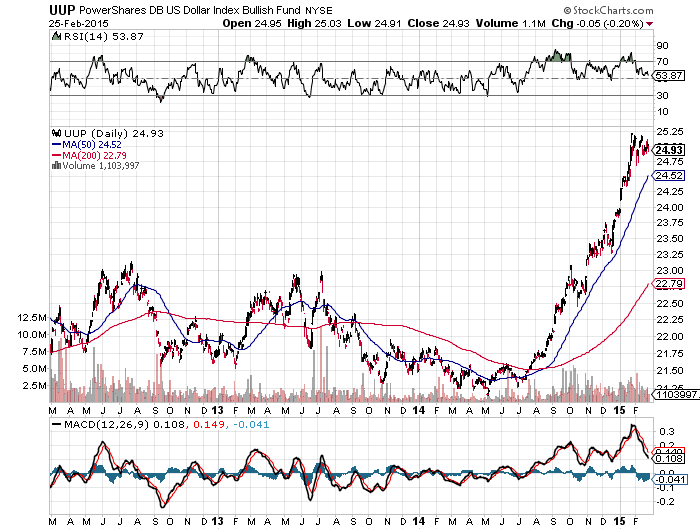 I believe the US dollar may weaken from here or at the very most trade sideways. We may get some more strength in the US, especially if the FED raises rates but for now, the US dollar should consolidate. In terms of long term future investments, markets always revert to the mean. Nevertheless markets can stretch for years and many investors underestimate the global power of central banks. Nearly all major economies now have their interest rates at practically zero and are printing money. Israel has been the latest country to lower its interest rates. These actions by central banks will have consequences in the future – no doubt. The problem investors have is knowing what bubble will form next. The Greek stock market surged almost 8% this week due to the new debt deal. Is Greece a long term hold – definitely not but any country that announces money printing usually gets a rising stock market. This is why the US stock market will rise in nominal terms as its being protected. The Gold trade may not come for a while. It will come but we may suffer another steep drawdown before the final bottom is in. In our 1% portfolio, we aim to be diversified and to pick stocks that have constantly grown and have constantly raised their dividends.. and its bearing fruit. More money has been lost by investors waiting for corrections instead of in the corrections themselves… Do you homework and trust your investments. Start with the end in mind. Invest with logic and leave emotion at the door.. This entry was posted in Trading and tagged (NYSEARCA:GDXJ), (NYSEARCA:UUP), Greek stock market surged almost 8% this week, What Does The Future Hold For Your Investments. Bookmark the permalink.